Live above the clouds and take in the extraordinary beach views from the 27th floor balcony. On the inside, you will find luxurious loads of natural light in every room. The living room boasts a feature wall with a mounted 60” Sony LED flat screen TV with surround sound, stereo and DVD player so you won’t be without great technology. If you are looking to relax, take up a good book in the nearby nook. Play a game of billiards on the unit’s private table. Off the main hall you will also find a half bath for guests. Kitchen provides a gas stove top and oven along with all you need to create any vacation treat. The table comfortably seats 6 and there is seating for 2 at the kitchen bar. This penthouse condo features two master bedrooms! The first master has a king bed and a private bay balcony along with an en-suite bath where you will find both a Jacuzzi soaker tub and a large shower. The second master also has a king bed, an ocean balcony and an en-suite bath with Jacuzzi soaker tub and shower. Third bedroom has a queen-sized bed and a set of bunk beds along with the third en-suite bath. Each bedroom has their own flat screen TV and the third bedroom has a second DVD player. Come enjoy a vacation in ultimate luxury at Palisade Palms! The beach is waiting! You may check out bocce ball equipment from the front desk. All staff members were more than ready to help and accommodate your every need. Wonderful team! 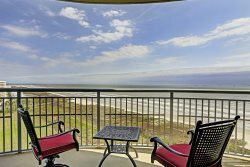 This is the top of the line property in Galveston. Perfect for a romantic holiday or family vacation. You will not find a more luxurious property outside of Miami. 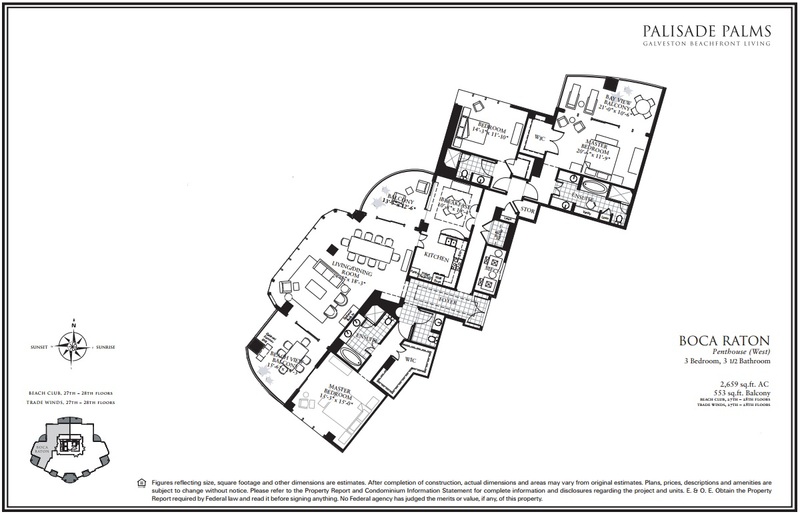 I have stayed at Palisade Palms for 3 years now, and this unit is absolutely pure LUXURY! Loved loved loved every inch of it!!! We rented this unit as an overflow for our family gathering at Thanksgiving. It was perfect! There were 4 adults and 2 teenagers staying in this unit. It is beautifully decorated and has plenty of room. Our family of 10 congregated there in the evenings where many played pool or just sat on one of the 3 porches visiting. We will definitely rent this unit again.